Each week, the box overflows anew. The letters stream in from various corners of California and its neighboring states, as they have for more than 20 years. They land in the nondescript mailroom of a squat, stucco-skinned building in Palm Springs, situated on a quiet side road next to dusty patches of for-sale land. Each day, Art Laboe and his right-hand woman Joanna Morones go in this room and pick out another thick stack of letters, each encased in distinct but recognizable envelopes. The ones from Corcoran State Prison are a little wider, with a red border around the front. Wasco State Prison features blue ink for its stamped address. Chuckawalla Valley State Prison has slightly beige envelopes, and so on. They hold letters from inmates, each inscribed with a short message for Laboe’s radio show and often longer words of gratitude for the man himself. The messages range in tone, from hopeful to remorseful, mostly directed toward wives and husbands, significant others, daughters and sons. Reading these messages is the centerpiece of Laboe’s radio work these days — and also the distillation of more than 75 years of pioneering in the radio industry as a deejay, programmer and record producer. Odds are, that woman grew up listening to Laboe, too. Such is the pull of this legendary broadcaster, who is on the Hollywood Walk of Fame and has influenced hundreds of radio stations all over the country. Laboe was simply the first to do so many things, and that work has made him an integral part of American entertainment history. Over that time, he’s outlasted most of his competitors and even some of his protégés. It’s an hour before Laboe’s Valentine’s Day Super Love Jam at the Honda Center in Anaheim, California, but the hype is beginning to build outside of the box office. A long line of fans has already formed, and Morones pulls out her iPhone and begins recording as she walks past them. “Hey, guys! Say hello to Uncle Art!” she calls out. The line erupts in greetings and general noise. “We love you!” one woman yells back. “Can’t wait to see you, Uncle Art!” another man in an L.A. Rams jacket adds. Laboe is famous for hosting concerts around Southern California, and the Valentine’s Day show has pulled in a big crowd with a lineup of R&B legends like The Whispers, The Delphonics and Peaches & Herb. This won’t be a sellout crowd for the 18,000-seat Honda Center, but later in the evening, when I look around the arena, it feels like the seats are filled up to the nosebleeds. The other thing that sticks out is the fact that so much of the audience is Latino, and of multiple generations — there are young couples in streetwear, as well as old-timers in wool suits and trilby hats, walking arm-in-arm with their glammed-up dates. Some have brought the entire family, including kids and grandma. 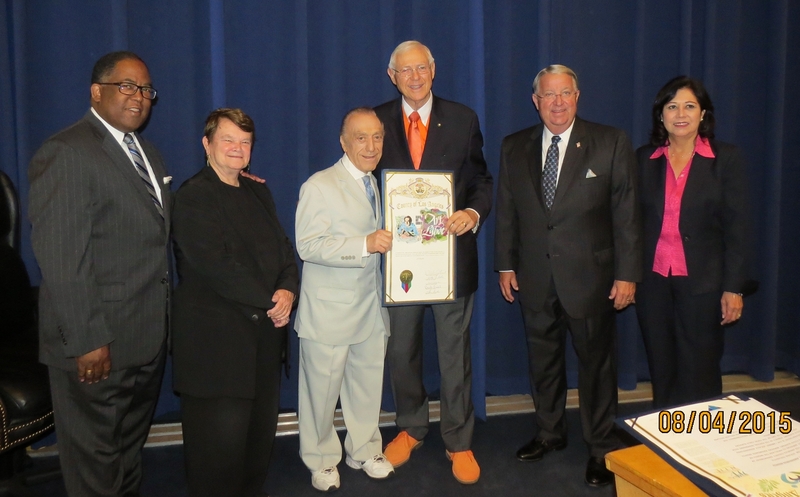 The comedian Paul Rodriguez once remarked that Laboe, who is of Armenian descent, is “more Chicano than some Chicanos,” adding that “everyone from the toughest vato to the wimpiest guy would say the same.” And it’s typical that this cultural embrace happened without Laboe planning it. He admits he hardly understands why they’ve bonded to him; Laboe jokes sometimes he’s the “only white guy” in the room when a Latino organization honors him. But the love is mutual, and has been for a long time. Born in 1925, Laboe grew up in Salt Lake City, Utah, persevering through the Great Depression (“What I remember is hunger, all the time”) before later traveling out to California to join his older sisters and attend high school in L.A. Radio remained his passion, and he was handy enough as a self-taught radio engineer that he snagged a job at KSAN in San Francisco at the age of 17. Then came World War II, which put his civilian job on pause. Laboe ended up in the Navy working as, naturally, a radio operator. Laboe’s career really gained momentum in the 1950s, when his on-air personality and style began to solidify. This was when Laboe first started broadcasting from Scrivner’s Drive-In in Hollywood, a spot that attracted big groups of teenagers after school. That set the scene for one of his biggest innovations: Filling the space between records with dedications from those teenagers, their laughs and chatter ringing out in the background. 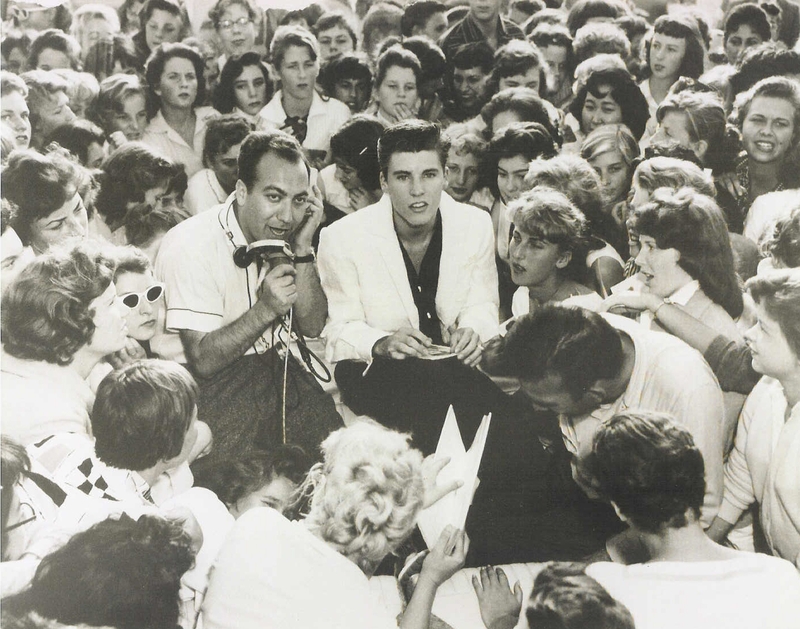 Laboe in the Scrivner’s crowd alongside heartthrob rocker Ricky Nelson. 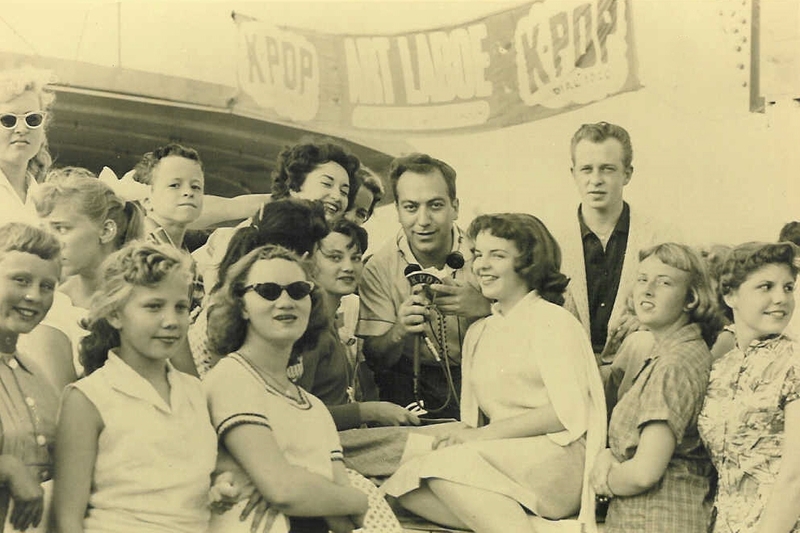 A young Art Laboe posing with fans at Scrivnner’s. 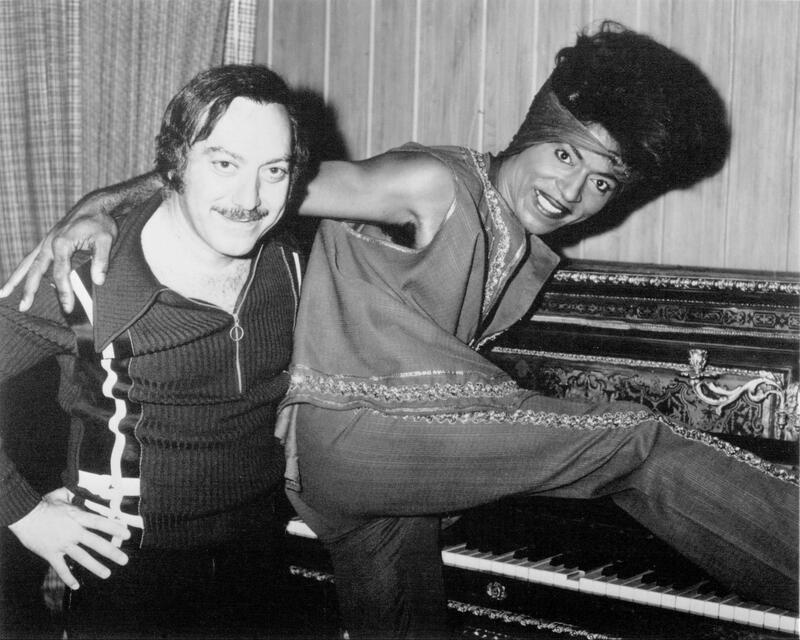 Laboe also was the first to host his own dance parties, despite L.A.’s law banning night dances for anyone under 18 years old. He found an aged arena in the neighboring city of El Monte, about 20 minutes east of Downtown L.A., that operated under different rules. He invited the rock and doo-wop acts that he was spinning: Tony Allen, The Heartbeats, Marvin & Johnny. The teens showed up in their washed and waxed lowrider cars, preening for social status in the parking lot and shuffling on the dance floor. The cherry on top was that El Monte Legion Stadium had no dress code — a breath of fresh air compared to most social functions at the time. Many of the young people who showed up came from black and Latino backgrounds, and those El Monte dances were a real taste of the melting-pot culture starting to show up elsewhere in American life. 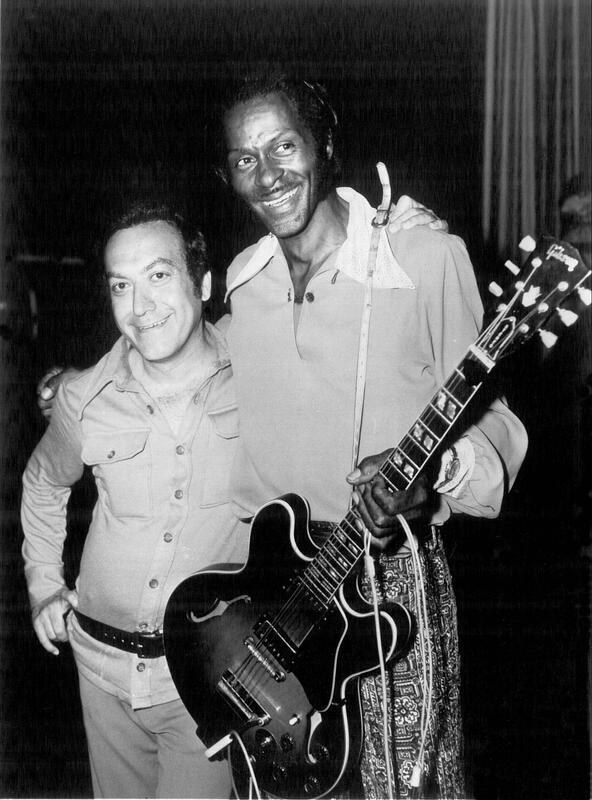 And for artists of color, Laboe wasn’t just a guy who could get them some airtime — he was the key to crossing over to white audiences and entering the mainstream. These days, Laboe’s closest companion is Morones, who is technically “head of marketing and promotions” but basically manages other parts of his life, too. She’s been by his side for 25 years, and seen firsthand how he has inspired several generations of deejays and radio programmers, who seem to speak of Laboe in the same way a guitarist would consider Jimi Hendrix. By the 1990s, Laboe was already a major force in the industry, having been inducted into the Hollywood Walk of Fame and the Radio Hall of Fame. Morones was only familiar with Laboe from a distance — she was working in radio at the time, too, though at smaller stations in San Bernardino. So when Laboe offered her a job in 1995 after several run-ins over the years, Morones wasn’t sure how to take it. At first, she wondered if it was the right step for her career. Then she researched his legacy. Laboe doesn’t have much in the way of family himself today — he says his sons passed away in the 1970s due to drug problems, and he’s been through a few marriages, though he won’t elaborate. His older sister Isabelle celebrated her 100th birthday in January. “Maybe that’ll be me, too,” Laboe says, though I can’t tell whether he’s earnest. For now, the physical limitations are starting to cut into his work, and Morones notes that Laboe usually can’t make it to midnight on his nightly shows like he used to. His fans, meanwhile, remain as dedicated as ever. Morones puts me in touch with a loyal listener, Nora Escobedo, who has been calling in to Laboe’s show twice a week, every week, for more than a decade. Escobedo tells me about her fiancé, Raymond, who began a life sentence in 2005 and is currently located in Kern Valley State Prison, 260 miles away from her home in San Diego. The couple do stay in contact with calls and letters, but creating a connection over the air on Laboe’s show is a different experience, she says. The radio program is a thread to normalcy, perhaps because they get to share their relationship publicly, if only for a moment. Raymond’s peers in prison like to rib him about the lovey messages they send each other: I love you, I’m thinking about you, and I’m here for you until the wheels fall off. The messages are often capped by a song request — eitiher “Hypnotized” by Linda Jones or “Happy” by Surface. The good news is that the ability to pre-record dedications means that his most important work continues, even if Laboe tires quickly compared to the old days. I watch as Laboe and Morones run through dozens of dedications in a single sitting, and Laboe’s voice booms with vigor when he swings the mic to his lips and begins reading.